SLM Toyota Uckfield recently visited the new Day Centre to see how the grant has improved their services.Earlier this year, SLM Toyota Uckfield were able to donate a grant of £1,800 to the Children's Respite Trust thanks to Toyota's GB's Fund For A Better Tomorrow scheme. The charity's main aim is to help families with disabled children get a much-needed break from the strain of caring for a disabled child 24 hours a day. The money was used to help them complete their Day Centre in Uckfield and we were very pleased to be able to visit recently and see their progress. 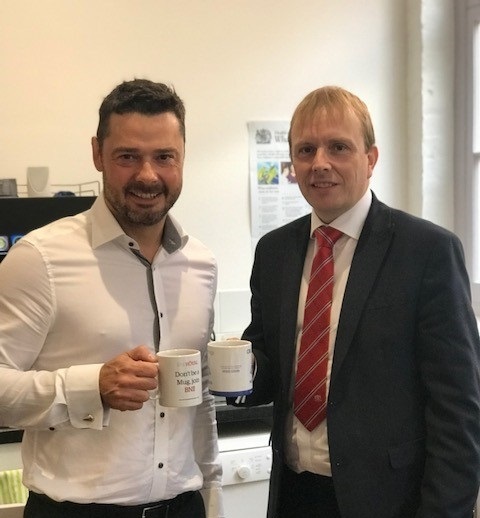 Paul Hardwell, General Manager (pictured above right) took the opportunity to meet with the charity's Chief Executive Gavin Fisher (pictured left) and see first hand how the charity helps the local community. Marketing Manager Mel Ball also visited the centre and they were both really pleased to make use of the new kitchen facility, funded in part by the grant, and see the colourful new play equipment installed for the children. Following on from our first donation, we are very keen to continue our support of such a fantastic local charity. We have discussed several exciting ideas to continue the partnership, including a dealership sponsored gift for the children this Christmas. Paul commented "I was delighted to meet Gavin and offer our full ongoing support for this incredibly worthwhile local charity, situated on our doorstep." Everyone at the dealership is looking forward to working with the trust in the future and watching the facilities develop even more.